With over 8,100 orders processed last year, PRO-TECH has the capabilities to meet your requirements, large or small. We assemble and package products for nearly all sectors of the Medical Device market in a wide range of packaging materials and configurations. Production runs ranging from a few to thousands are routinely managed through our dedicated locations. Multiple packaging lines ensure nearly 100% uptime and available capacity. We are dedicated to finding solutions to meet your unique needs and are proud to maintain an on-time delivery rate in excess of 97%. Need to scale your Assembly & Packaging? 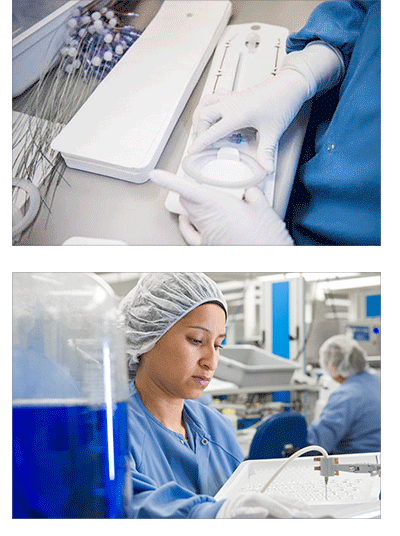 PRO-TECH’s services include contract assembly, packaging and kitting capabilities of life science products. Our team of highly skilled operators has extensive experience in automated and manual assembly of diagnostic, medical device and healthcare related kits. A diagnostic company developed a proprietary test to diagnose underlying patient symptoms. The company designed a convenient kit that is given to patients to collect individual samples and ship them to the laboratory for testing. Initially, as volume was small, the company used engineers and administrative personnel to assemble the kits. As volume increased, they could no longer handle the assembly and packaging of the kits. They were at a crossroads and needed to decide whether to set up their own facility and quality system or find a contract manufacturer with the experience and capability to handle the project. PRO-TECH was contacted to see if we were a qualified vendor capable of assembling the high volumes needed. The customer required a company that is ISO-13485 certified, FDA registered, has experience assembling and packaging kits with several components, and understands how to handle serialized product. In short order, PRO-TECH was able to set up kit assembly and packaging specifications for kits containing over 15 components as well as train employees on the correct assembly process. Within 7 business days of all components arriving, PRO-TECH assembled, packaged and delivered the kits to the customer, which resulted in a successful ramp-up and they are still satisfied customers today.